In March at South by Southwest, Marvel Entertainment made some noise for comic book fans when it announced its new augmented reality app called Marvel AR. 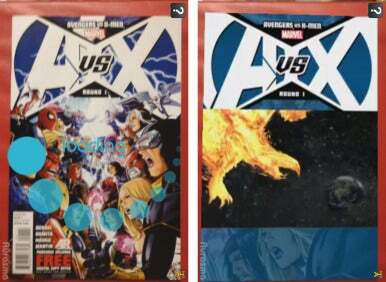 The AR app for iPad, iPhone, and iPod touch is now available in the App Store, and the first comic book that can be used with the app is Avengers Vs. X-Men (AvX) Round 1. I’m sure you’re familiar with the special features on DVD and Blu-ray movies, such as behind-the-scenes shorts, deleted scenes, and commentary. AR does the same for comic books, providing readers with additional content—commentary by the comic book creators, artwork, videos, and more. In comic books designed for AR, a red and white AR logo is placed throughout the book. The app uses your iOS device’s camera to scan the AR page and deliver the additional content. An Internet connection is required, and I had no performance problems when using Wi-Fi on my iPad. When using a Sprint 3G connection on my iPhone 4S, videos would pause midstream several times in order for the buffer to catch up to the playback. 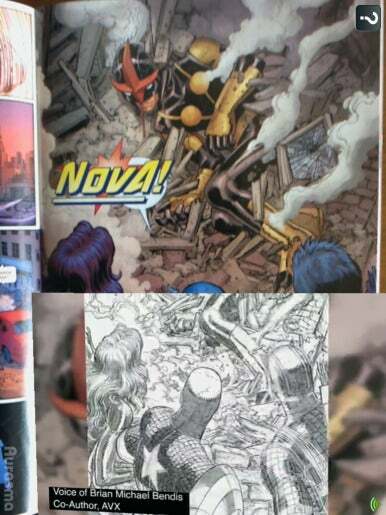 Preview: When using the AR app on a comic book cover with the AR logo (left), readers can watch a video about the comic book using the AR app (right). The AR app senses the AR logo almost immediately. However, you must keep the page with the logo within the range of your camera. For instance, while watching a video, I thought I could move the iPad to a more comfortable position, but once the page was out of the scope of the iPad camera, the video stopped playing. It would be nice if the AR logo simply triggered the content to be displayed, and then you can move your iOS device to a better position for viewing while the content continues to play. Inside the book, AvX Round 1 has seven AR logos (eight if you include an AR logo for a Marvel AR ad). One of the special features is a video promoting AR by Marvel Editor in Chief Axel Alonso. Several of the ARs showcase the development of the artwork from pencils to final ink and color output on the page—one artwork feature shows alternative art that the creators considered before deciding on the version you see on the page. There’s also an AR that shows a background information card about a main character, and another with a background video of a major institution in the Marvel Universe. The one major complaint I have is the low resolution of the content. The videos are jaggy and I often saw images and videos that were blurry or had lots of image noise. Marvel is probably mindful of the amount of bandwidth the content requires, and it seem that quality is being sacrificed for performance. Commentary: AR content includes commentary by the creators and a look at the art production process. The key to the success of AR will be the content. Marvel will need to make sure it is providing interesting, compelling content that will appeal to serious, longtime readers as well as newcomers. Wisely, Marvel did not use the AR features to progress the story in the book, since that would create holes for readers not using the app. All of the AR features in AvX Round 1 provide background or behind-the-scenes info, and depending on how you like to read, you might find using the AR app disruptive, since the AR features take you out of the flow of the story. You might want to first read your book uninterrupted, and then do a second reading where you check out all the AR features—that’s the method I prefer. The Marvel AR app will appeal to aficionados who enjoy looking behind-the-scenes for the comic production process and are immersed in the Marvel Universe. AR is not a replacement for the Marvel Comics digital comics reader—if you read digital comics, AR might be the reason you visit your local comic book store and buy printed copies of your favorite books. However, you can continue to enjoy your comics—digital or printed—without using the app, since the AR content is there to supplement the stories.